In a country like ours wallowing in low literacy levels and plagued by a poor reading culture, unethical journalists at State owned and government controlled print media easily get away with factual inaccuracies, legal heresy, distortions, half-truths and blatant lies. 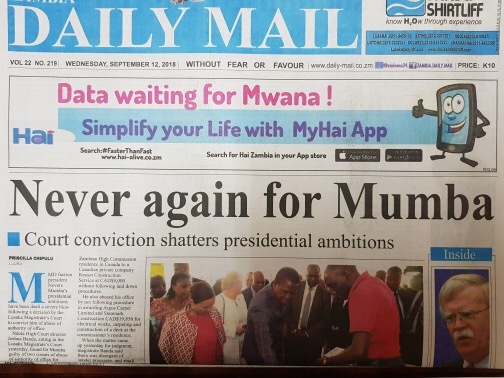 A case in point is the banner headline gracing today’s edition of the Zambia Daily Mail newspaper decorated with a screaming title “Never again for Mumba: Court conviction shatters presidential ambitions”. Nothing can be further from the truth. A plain reading of Article 100(2)(h) and (i) of the Constitution, as amended, would clearly shows that a person is only disqualified from being nominated as a presidential candidate if that person is “serving a sentence of imprisonment” or “has, in the immediate preceding 5 years, served a term of imprisonment of at least 3 years”. Having been absolutely discharged by the Subordinate Court, which convicted him of 2 counts of abuse of authority of office, Nevers Sekwila Mumba has to all intents and purposes escaped a term of imprisonment. It is, thus, factually and legally incorrect to suggest, as the charlatans at Zambia Daily Mail would want to have us believe, that Nevers is debarred from standing as a candidate for election to the office of President. It is one thing to disagree with Nevers about his brand of politics or political ideology but it is another thing altogether to falsely and recklessly misrepresent his eligibility to vie for high political office using a publicly funded media platform like Zambia Daily Mail Newspaper. Truth telling should not be subordinated to Goebbels-type propaganda and political point-scoring.